EuroBasket Women 2009 qualifiers success for "les bleues"
France have booked their ticket for EuroBasket Women 2009 in Latvia with an overtime win (68-64) over Hungary. 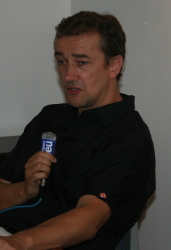 Pierre Vincent was delighted with the qualification of his side and the victory. He also explained that he was disappointed the players failed in the execution of basic tasks while excelling at difficult tasks. Laszlo Zatgaber, the Hungarian coach, was disappointed in losing the match after coming so close. But at the same time he was pleased with the progress of his side. He said that when a country as small as Hungary lost eight players at one go, it was very difficult to replace them. Hence the team had to be rebuilt. This is what had been done and six of the players in his current roster were new to international basketball. Some of the players were playing more minutes that they would normally play as he did not have the depth in numbers. During the interval he gave his players one of his famous inspiration speeches and they almost pulled it off. You will be able to read and listen to all the after match comments at the bottom of this page by following this link. Petra Ujhelyi got the first points on the board for Hungary after a patient build-up with a little over 30 seconds on the clock. 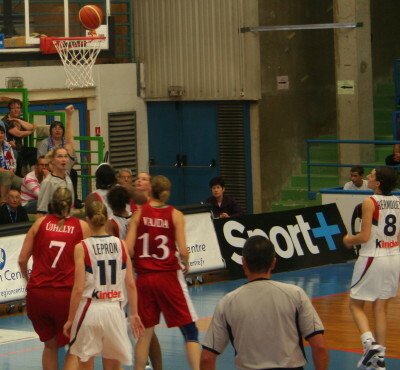 France quickly responded as Céline Dumerc set up a sequence of moves that allowed Isabelle Yacoubou-Dehoui space to work in the paint and score. Yacoubou’s early dominance in the paint saw her score again shortly after Emmanuelle Hermouet hit a baseline jumper. It appeared that France was about to run riot (6-2). However Hungary took control and went in front after Orsolya Englert was left open in the corner to hit 2 points (7-6). Sandra Dijon-Gérardin was called into action and scored her first points within 10 seconds of entering the court. In the meantime Dumerc and Englert were having a private contest. Englert got the first point in the contest when she managed to hit a jumper while off balance and draw Dumerc into fouling her (10-8). Dumerc was not to be put off and responded with a shot from beyond the arc. France’s tough defending prevented Hungary from scoring again while points from Dijon-Gérardin, Yacine Sene and Endeme Miyem gave France a (16-10) lead at the end of the first period. Nora Bujdoso was called for a charging foul on Sene at mid-court 53 seconds into the second period after the game was getting more physical. Meanwhile France had lost their momentum. They missed their first three attempts and turned the ball over twice before Miyem finally settled their nerves with a lay-up finish after nearly two minutes of play. France continued to make life difficult for Zsófia Fegyverneky. They increased their advantage with first Hermouet scoring a three-pointer. 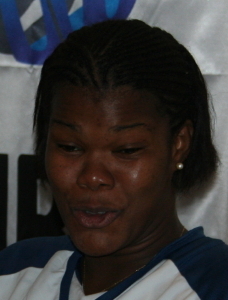 Then Emméline Ndongue came up with some magic (27-16). By the time Florence Lepron added 2 more points Zatgaber (left) called for a time-out. The game became rather technical after this. France - despite having the upper hand - conceded two late baskets. They went into the interval only leading by 10 points (34-24). 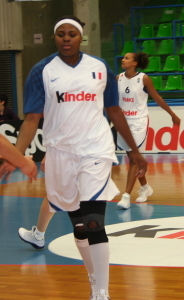 Yacoubou-Dehoui got things started offensively for France with the first points of the second half. But it was the efforts of Dumerc that got the home fans off their seats. She pulled off a 24-second-buzzer-violation three-pointer when it appeared that the chance was gone by floating the shot over Englert. Dumerc had not finished as her next action was to find the broom and attempt to mop up the floor before being stopped. France maintained their momentum and Clémence Beikes made it (42-26). Hungary weathered the storm and hit back with 5 points from Englert (2) and Bujdosó (3). Dijon-Gérardin then tuned the clock back with a turn-around hook shot quickly followed by a standard jump shot in the paint (46-30). Hungary switched to zone defense which put a stop to the French further advancing. 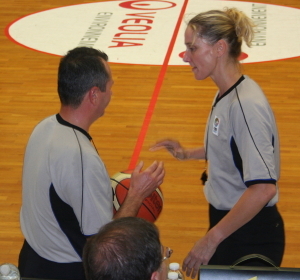 When Diana Fürésa was called for 2 charging fouls the Hungarian coach Ratgaber had a few words with the officials. Afterwards Dijon-Gérardin from France picked up 2 quick fouls. The rest of the period was played out on the free-throw line with France holding on to the lead (49-41). The officials continued to call fouls. However this did not stop Ndongue in attack as well as in offence to score the first 5 points for France in the final period. France were not having it all their way as Fürésa took over scoring duties for Hungary as she hit a couple of three-pointers for her side to reduce the deficit to 7 points with less than six minutes to play (49-56). The French team struggled defensively. They left Englert free at the top of the key to hit a three-pointer (52-56). The defensive woes of France continued and did not get better as Yacoubou-Dehoui (left) picked up her 4th foul on Ujhelyi and had to leave the game temporarily. Despite Dumerc’s efforts to get things going for France, the ball refused to drop. It was up to Hungary to profit with Bujdosó who scored. With 2:53 left to play France’s lead was reduced to 2 points: (56-54). Lepron thought she had made the game safe for France with 2:11 to play. But her shot was disallowed for travelling. With 90 seconds left to play Lepron surprised everybody to pick up an offensive rebound and to recycle the ball to give France another 24 seconds to make the game safe. Hermouet had the first chance to score but was blocked by Bujdosó. Yet the ball fell to Dumerc but she missed the target. Then Hermouet was called for a foul on Bujdosó, who made her free-throws to level the game (56-56). The last 52 seconds of regulation time did not go well for France as both Ndongue and Miyem split pairs from the free-throw line while Anna Vadja hit a jump shot for the game to finish (58-58). 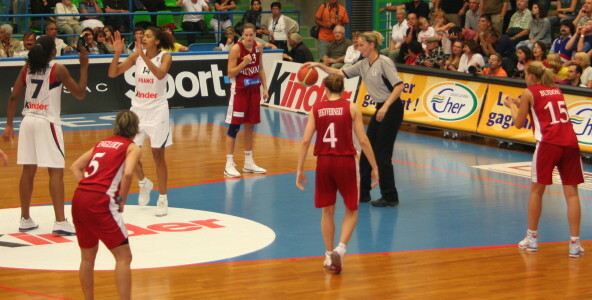 Overtime was action packed with Dumerc (right) stealing the show with clutch 3-point shooting to keep France in the game. The two teams were still level (64-64) when Vadja’s block on Ndongue was called as a foul. Ndongue kept her composure at the free-throw line to score while Vadja had to leave the game on 5 personal fouls. Hungary still had a chance to tie or win the game. But Sene managed to get the ball out of the hands of Englert before being knocked to the ground. Sene somehow managed to get a pass to Lepron. Lepron was fouled on her way to the basket. 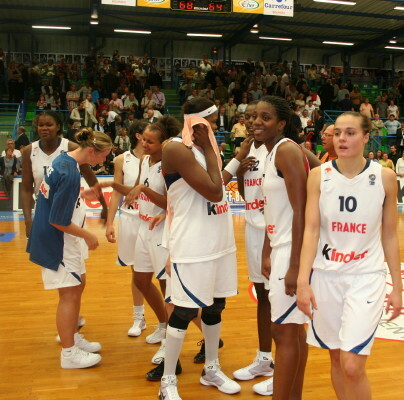 She hit her free-throws and France won the game and their EuroBasket Women 2009 qualifiers group. Dumerc finished for France with a double-double of 12 points and 10 rebounds. She was joined in double figures by Yacoubou-Dehoui with 11 points and 11 rebounds. Ndongue added 12 points. For Hungary Bujdosó top scored with 17 points. In double figures was Vajda with 13 points and 14 rebounds. Englert and Füresza had 11 points apiece. 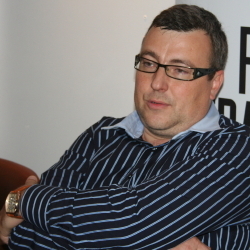 Laszlo Zatgaber was satisfied because this was a new Hungarian side and many of the players were having their introduction to international basketball in this Eurobasket Women 2009 qualifiers campaign. He explained that he tried to play with a full roster but it was not possible because of the level of experience of the players. Céline Dumerc spoke about this match with its twists and turns and confirmed that they should have won it without going to overtime. But the team turned the ball over too often and had to pick themselves up to finally win the match. The yo-yo effect continued in overtime. However the players were young and had its good points and finally mobilised their efforts to ensure victory. Céine Dumerc spoke to us after the EuroBasket Women 2009 qualifiers press conference about playing at the Prado which is her home court. She explained that she always liked to play there no matter what jersey she was wearing. She went on to talk about the home feeling as the Prado was a familiar environment. While it was home for her, it was not for the other players. However playing in France for the national team implied playing at home and this night the fans were great (just like when playing for Bourges). 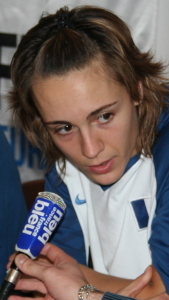 Céline was very happy with the EuroBasket Women 2009 qualification and with her summer so far. But she pointed out that it was not finished as they still had one match to go which they had to prepare for. 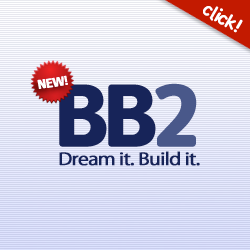 This was important for the squad which was still under development. Emmanuelle Hermouet was surprised to have been called up to play for France this summer in the EuroBasket women 2009 qualifiers after her season out with injury. She was happy with the results for the team. She was still coming to terms with everything that had happened so far. She was also looking forward to her season with Toulouse. Playing in NF1 would also be new for her. There will be exciting times ahead for Emmanuelle who recovered to speak to us after being knocked out at the end of the 4th quarter.